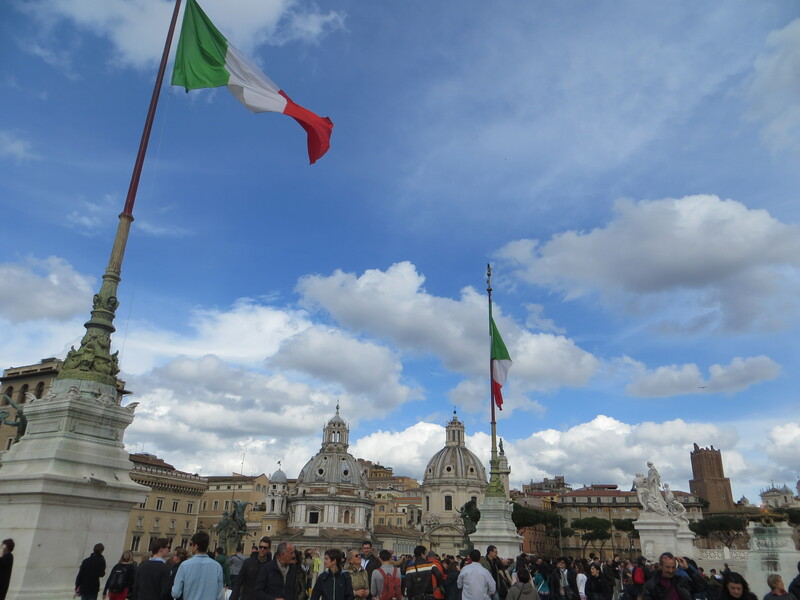 My life and travels while living La Dolce Vita in Genoa, Italy. On the morning of Wednesday April 3, we awoke in Rome for another yummy breakfast in our hotel, featuring fresh-baked cakes, breads, Nutella, cheeses, eggs, cereals, coffee, juice . . . plenty of options for a free hotel breakfast in a country where it is very common to just have some bread and coffee. The sun was making an appearance, brightening the room and our spirits. I grabbed a few pieces of fruit for the journey, and we headed to the room for the final check out. 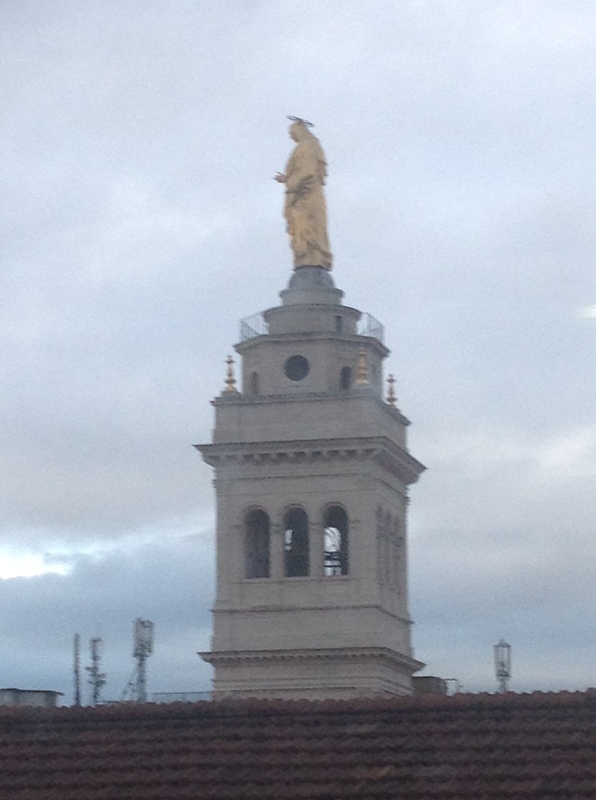 Farewell Sacre Coure golden statue, the beautiful view from our 6th floor room. View from our Rome hotel room – taken from my iphone. Luckily, our hotel was just meters from the Roma Termini Train station, so it was easy to walk and board our train to Milan. It was a super high speed train that would whisk us to Milan in less than 3 hours, a journey that could take a very long time with regular trains. We paid dearly for the ticket, but with limited time and an ambitious itinerary, this was the way to go. A bit of reading, a bit of napping, passing through gorgeous Tuscan rolling hills . . .Brendan tapped my knee to point out when we were in Florence. “You love this city, right?” I do like Florence, and was especially fond of my recent visit with Kat. Then before long, we were pulling into Milan’s Central Station where were transferred to a packed Swiss train for the Alps. It was so crowded, that even though I booked weeks in advance, we didn’t have seats next to each other — just across the aisle. No problem. Brendan was reading a good book, Umberto Eco’s Baudolino. I had a book for book club, Erik Larson’s Devil in the White City, but I just couldn’t get into that dark world of mystery and terror. I was craving more of light and fun travel writing. Anyway, I was sitting at a table with two Italian grandparents and their charming little granddaughter, coloring and chatting away. Grandpa was kind, and we spoke to each other with my limited Italian and his limited English. Very friendly. And Grandma made sure I was well fed throughout the journey with pizza, foccacia, and other snacks. It made me miss my own grandparents and my own family in general. They were from Recco, a local town nearby on the Ligurian Coast, bringing their granddaughter back to their son and daughter-in-law, who live in Frankfurt, Germany. Maybe she was visiting for Easter? The son was going to pick them up from Basel to lessen the amount of time the girl would have to spend on the train. But she was loving it at this point. This train ride is one of the most scenic, starting just minutes after Milan. On a clear day, you can see the snow-capped peaks surrounding Milan. 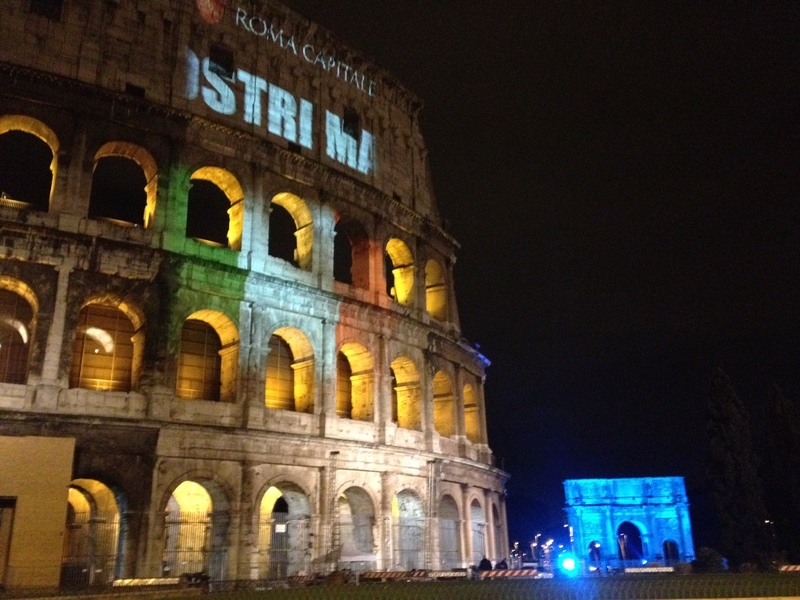 We glided right towards them, first stopping in a charming town called Stressa. Stressa is nestled along a lake, and seems like a charming and inviting escape near Milan, and ultimately not too far from Genova. 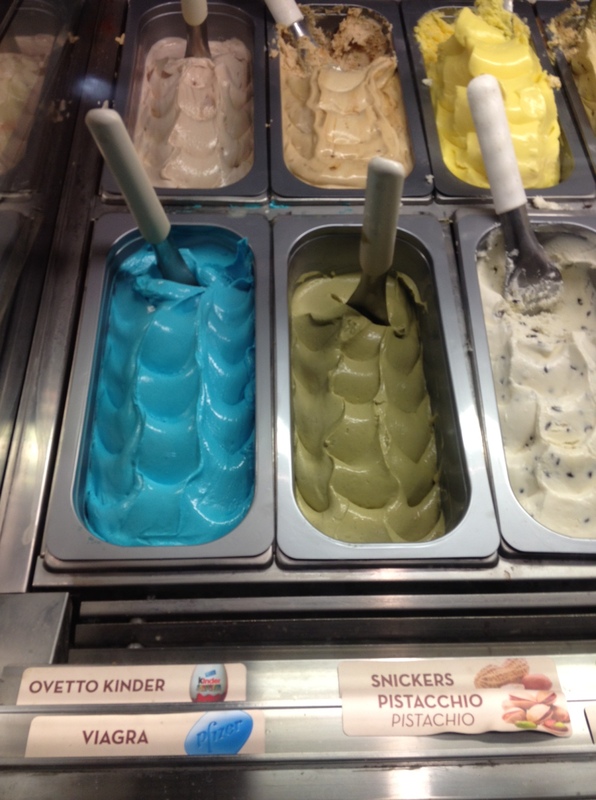 I should go sometime during swimming season. 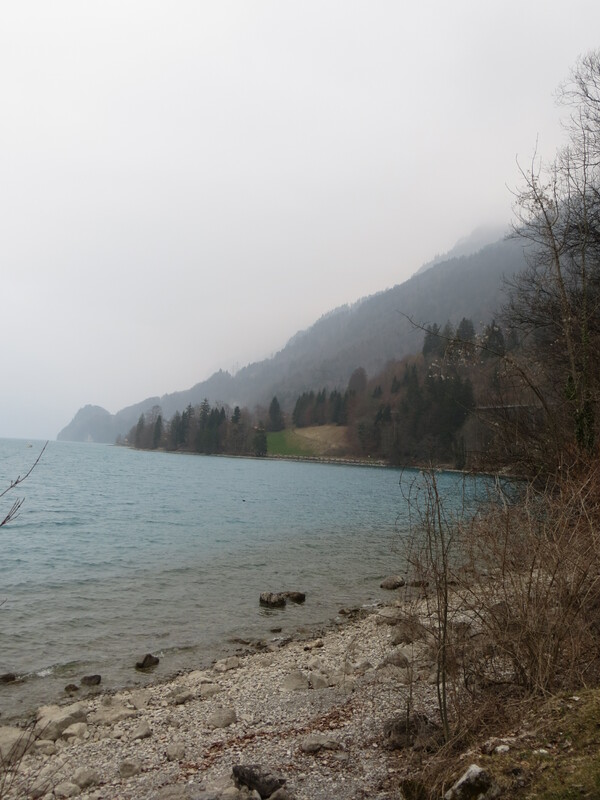 After Stressa, the mountains grew more dramatic, the lakes bluer, and soon we passed through some tunnels and popped out along Lake Thun, stopping in Spiez. 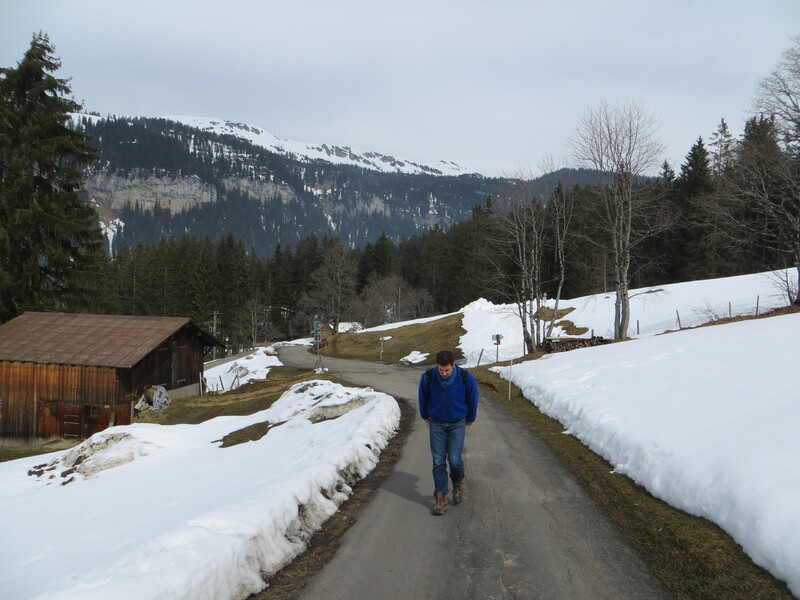 I traveled this same route with my seniors in February for a snowy writer’s workshop perched in a hotel in Wengen, up in the Alpine Peaks of the Berner Oberland. 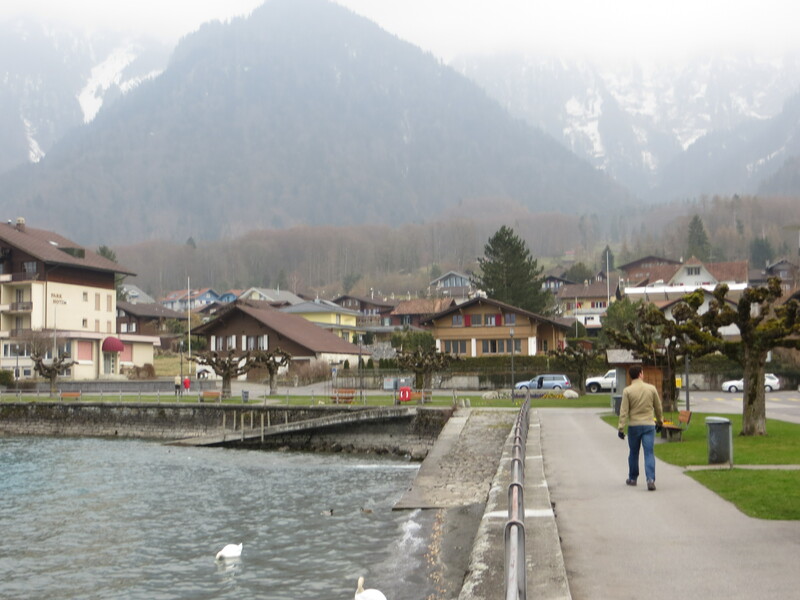 When Brendan said he wanted to see alps, I knew we had to head to that region, and I could think of no better place than my favorite spot, Interlaken, nestled at the base of those peaks between two turquoise glacial lakes, Thun and Brienz. The air was fresh, the vibe instantly awe-inspiring. 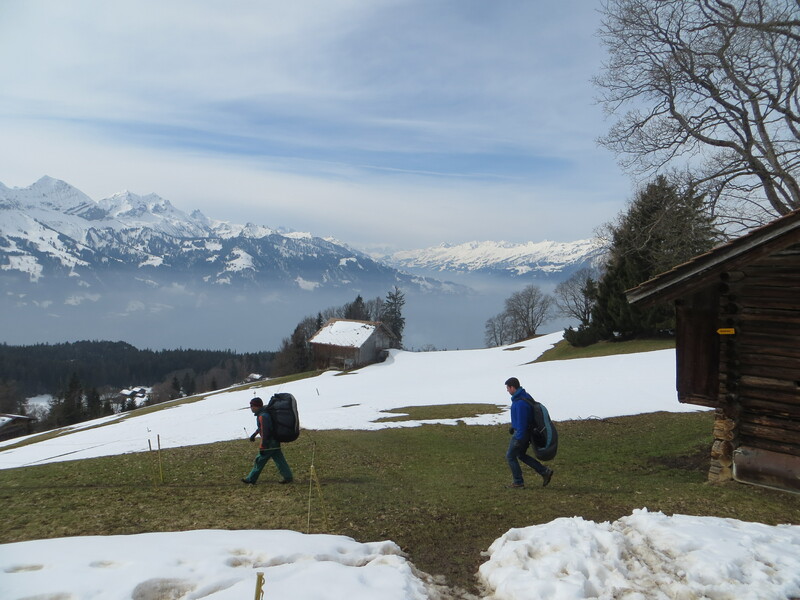 We climbed into our last train for a short ride to Interlaken and exited in bright, relaxed spirits. It was sunny and slightly foggy, probably because of the snow-melt. We had arrived in the off-season, where skiers were squeezing in their last runs on the slopes while snow melted in the lower elevations. I clapped my hands with exhiliration and pure joy on my 10th visit to my favorite place in the world. 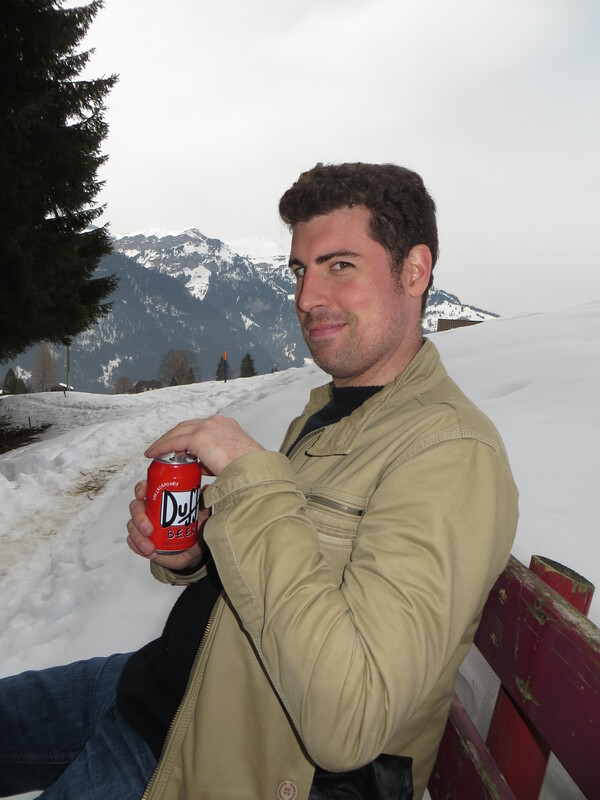 Brendan’s hay fever and jet lag were both minimized and he instantly appreciated the stunning peace and beauty of the region. Even in the off season it was stunning, with both green grass and snow-capped peaks. “Are you happy?” he asked. 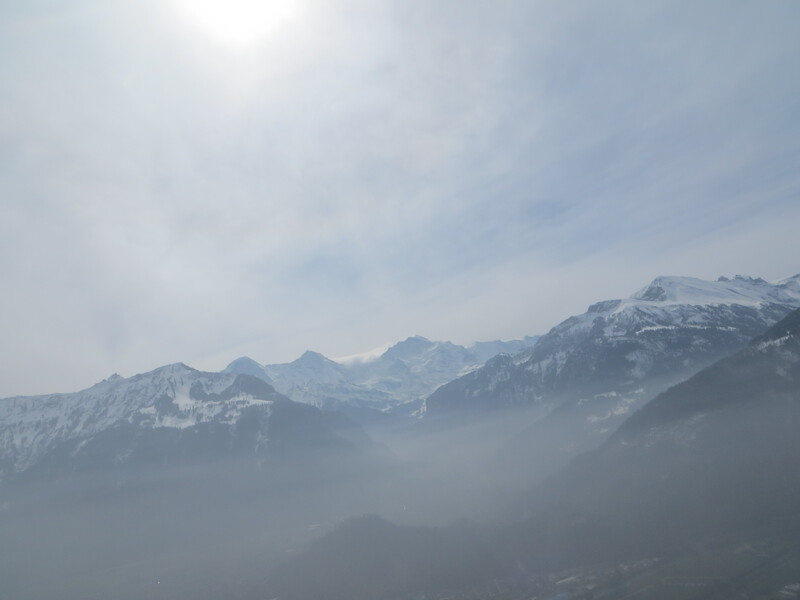 The Jungfrau Region. 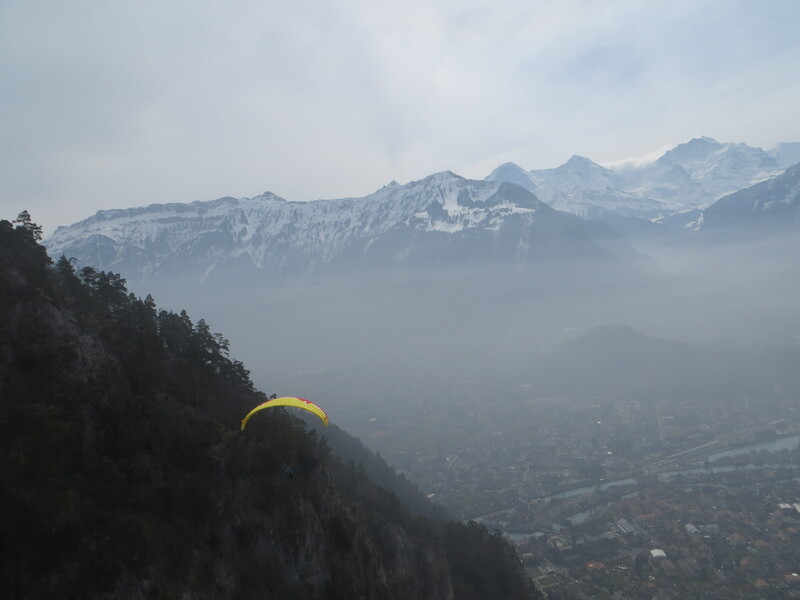 Interlaken is in the valley between the lakes. 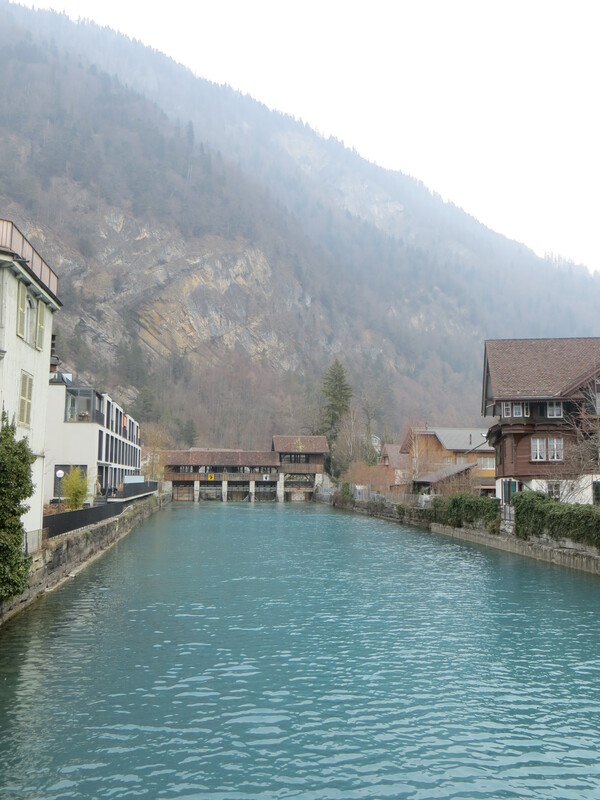 We took the short stroll to our hotel, which I had found along the River Aare, a blue green river connecting alpine, glacial Lake Brienz with the slightly warmer castle-strewn Lake Thun. I spent many days swimming in these lakes during summer visits. In my winter visit they were a steel gray, so I was glad to see them back to their vibrant blue. Our hotel was actually a few guest rooms above a restaurant. We had a view of the river and the high peaks beyond, including Jungfrau, the highest peak in the region, snow-capped even in August. We were extra lucky with our room because they upgraded us to a spacious suite, and the hotel staff couldn’t have been more friendly. 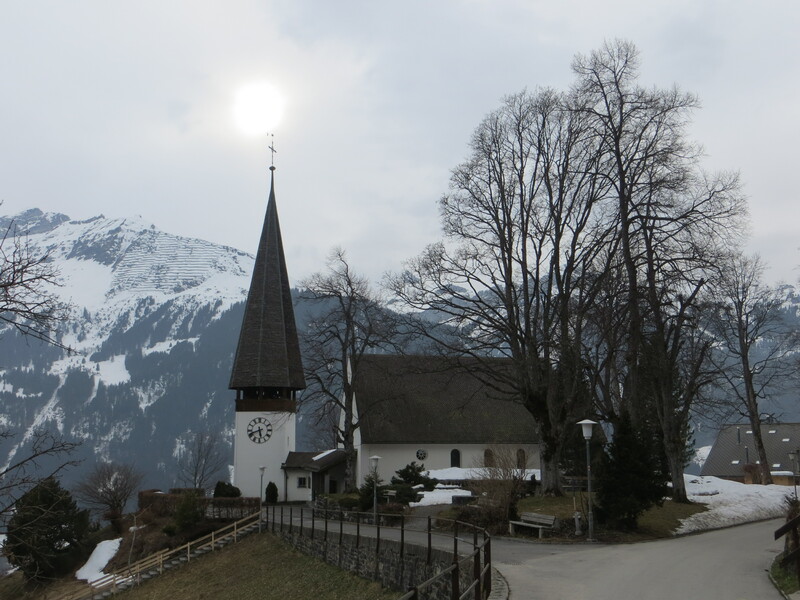 Brendan was impressed with the Swiss Hospitality, and while I had grown to love it from all my other visits, I too was impressed and appreciative. 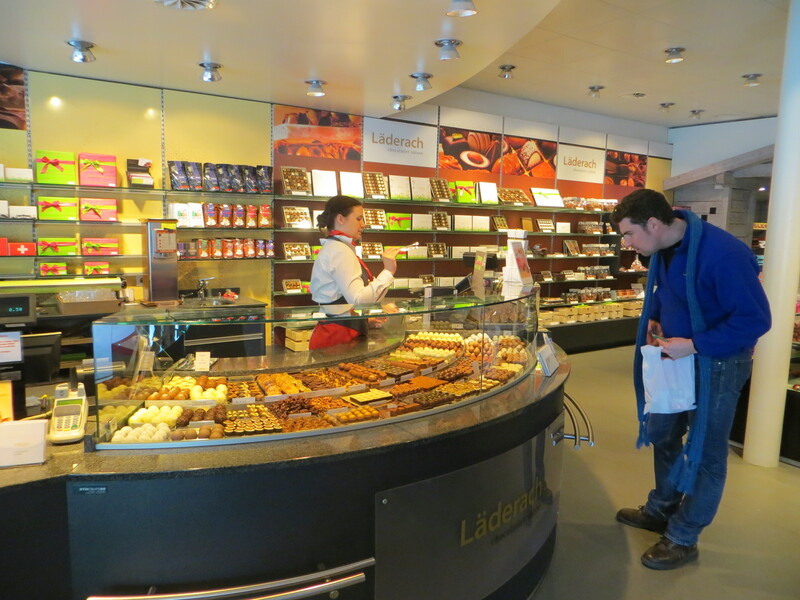 The difficult task of choosing from all the wonderful swiss chocolate. 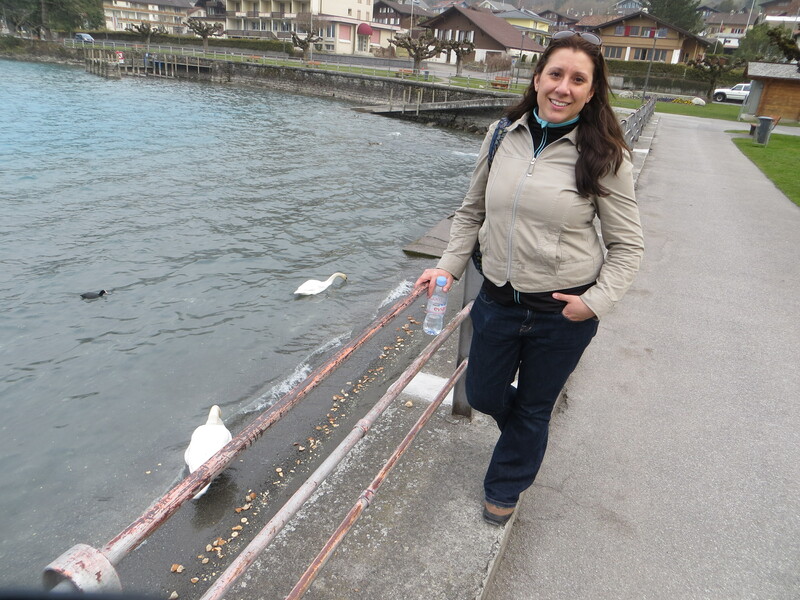 After some shopping, we went for a walk to Lake Brienz. 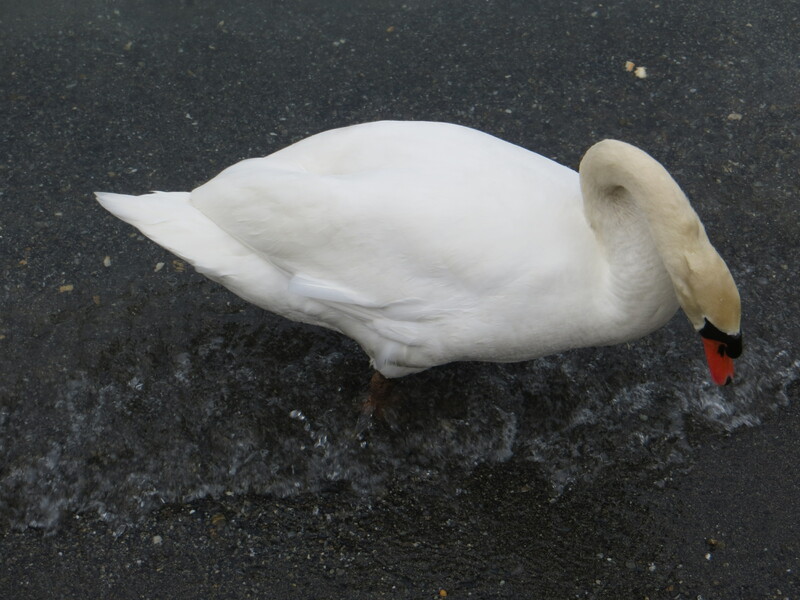 In this shoulder season, we had the whole trail almost to ourselves as we wandered through the woods, gazed at the majestic water, and passed my swans in Bonigen. We continued along to Iseltwald, nearing the waterfall when, suddenly, the souls of my 1998 hiking boots literally split and fell apart. The rubber was that old. The boots were not worn away, but I guess that stuff doesn’t last forever. 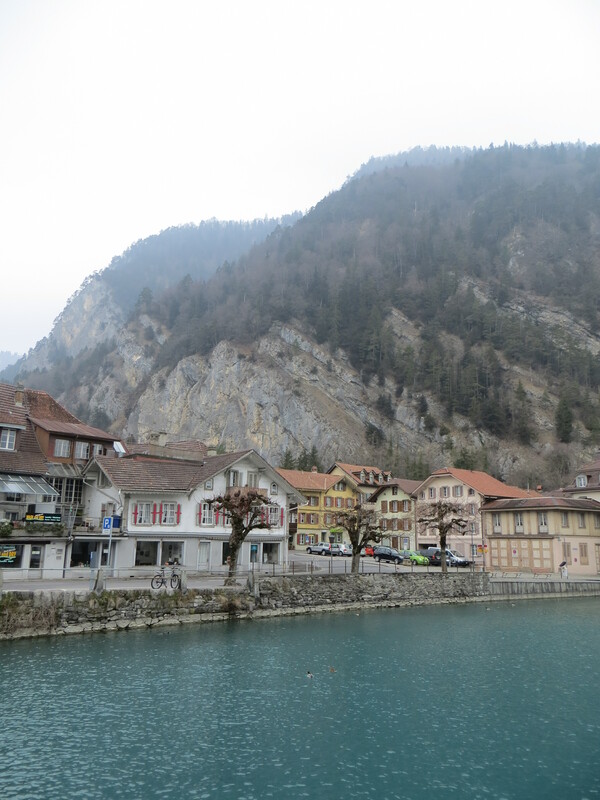 In such a charming location, it didn’t affect me much at all as I hobbled along, but we decided to turn back, and boarded a bus for Interlaken back in Bonigen, continuing good, animated conversation and philosophy. 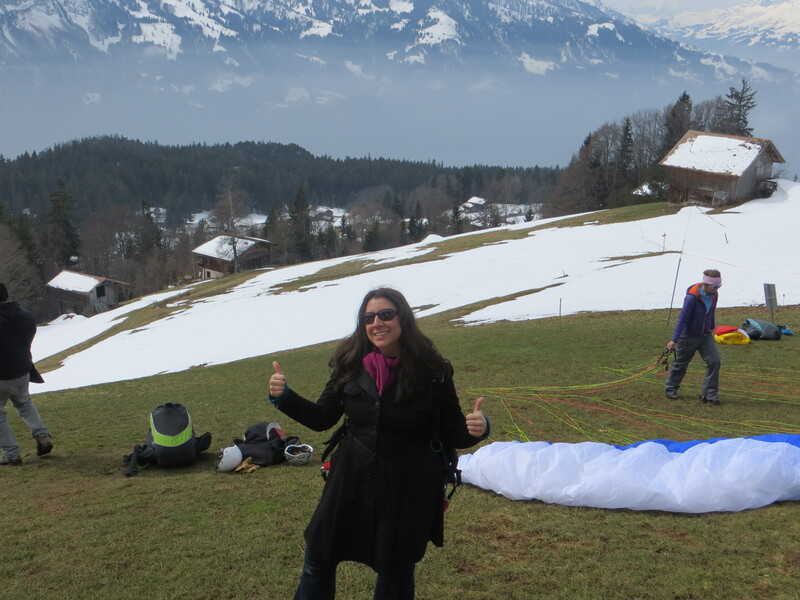 Then we booked PARAGLIDING for tomorrow. My third time and Brendan’s first. We were going to fly. That night, we went for dinner in the Happy Inn Lodge, a very special place for me because I stayed in this hostel my first time in Interlaken with my friend Anna the summer of 2001. 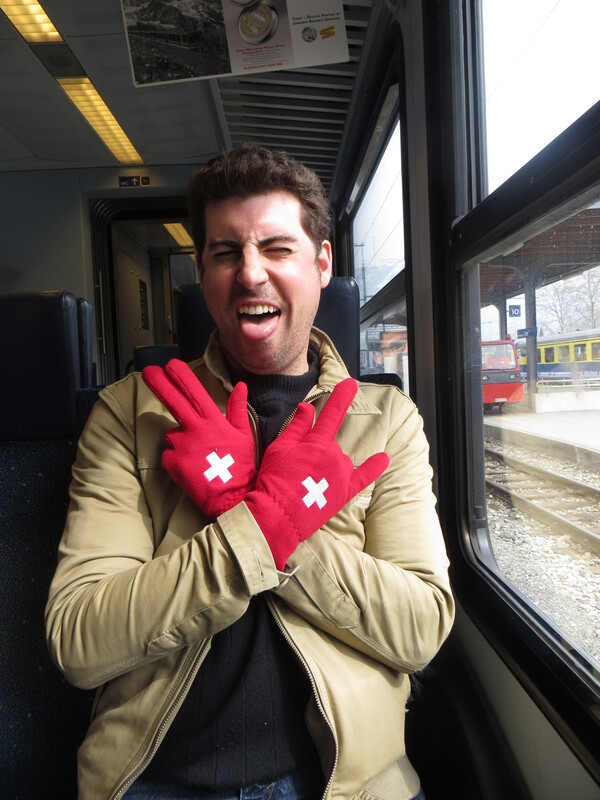 We had always wanted to visit Switzerland, and spontaneously boarded a night train from Amsterdam when we were unable to get accommodation. We didn’t have sleeper cabins, so we sat in the seats all night and made friends, groggily rolling into town in complete silent awe along with our fellow passengers as the mountains revealed themselves to us. It was the most beautiful sight I had ever seen. At the train station, we went to the hotel board, saw hotels with availability, picked up the phone, and the Happy Inn Lodge welcomed us. We stayed there, shared some drinks, and enjoyed a splendid stay, my first of many. While Brendan and I opted to stay in better accomodation, Happy Inn Lodge has good beer and food, and was perfect for a peaceful dinner, followed by a walk through town to the outskirts, where I checked on the dance club at the hostel Funny Farm. Closed tonight, but it would be open tomorrow (Thursday). Good Plan. Back to the hostel where we watched some tv on NBC.com on the iPhone before drifting into mountain-air dreams. 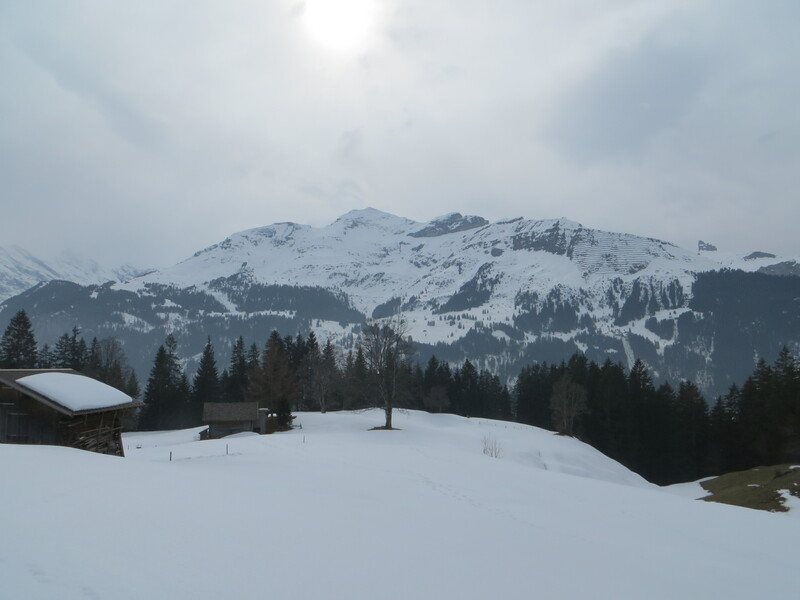 On Thursday morning, we awoke for an absolutely delicious Swiss breakfast in the hotel, including homemade jam, fresh breads, farm fresh eggs, cappuccino, hot chocolate, whatever we wanted. Everything was fresh and flavorful, and again, the staff were super warm and friendly. We prepared to fly, and a van came to pick us up, toting us to the top of a nearby mountain. 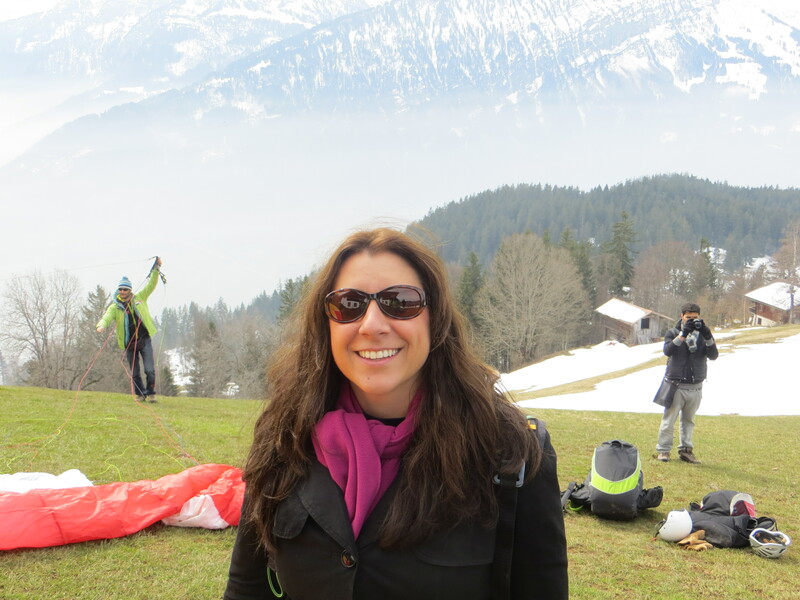 I went paragliding that first time with Anna in 2001, and it was the most exhilirating experieince of my life to that date. It was summer. And it was summer when I went again with my friend Krista in 2006. 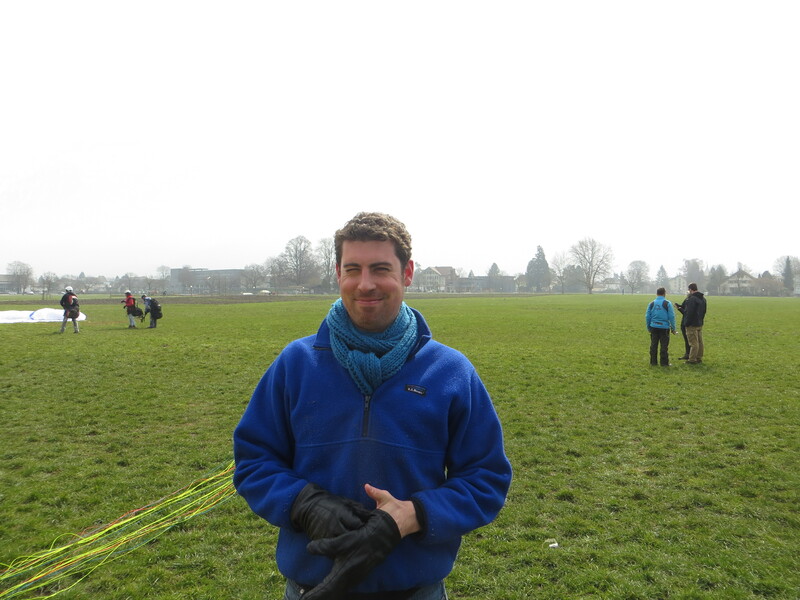 Now in 2013, I went for my third flight in early spring. 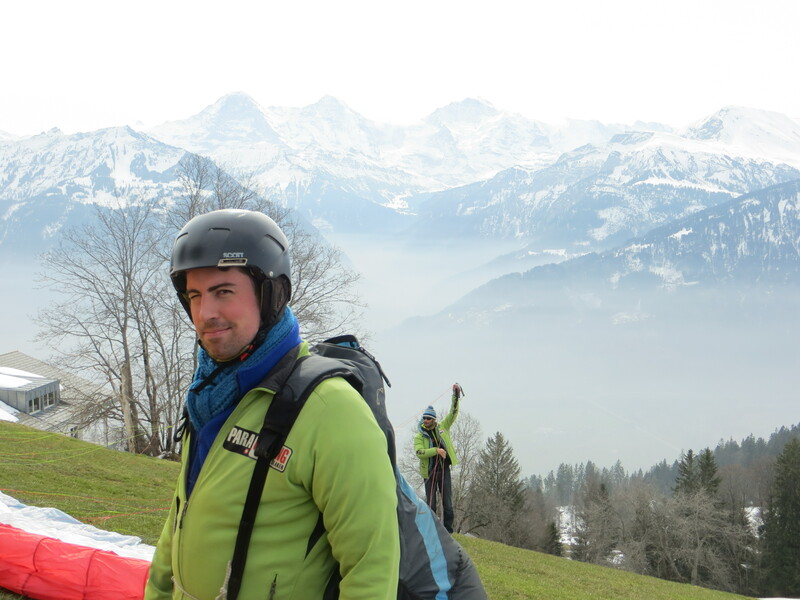 They suited us up in helmets and our seat, attached us to our instructors, and I snapped some photos of snowy mountains and the grass making her spring appearance. Before long, Brendan was running down the hill then AIRBORNE. I was so exited for him because I can never forget that first time you are flying, feet dangling in the sky among the birds and trees. Then I ran down the hill, and shortly after we were in the air, my instructor had me take the controls and allowed me to steer and fly a bit. “You’re ready now. 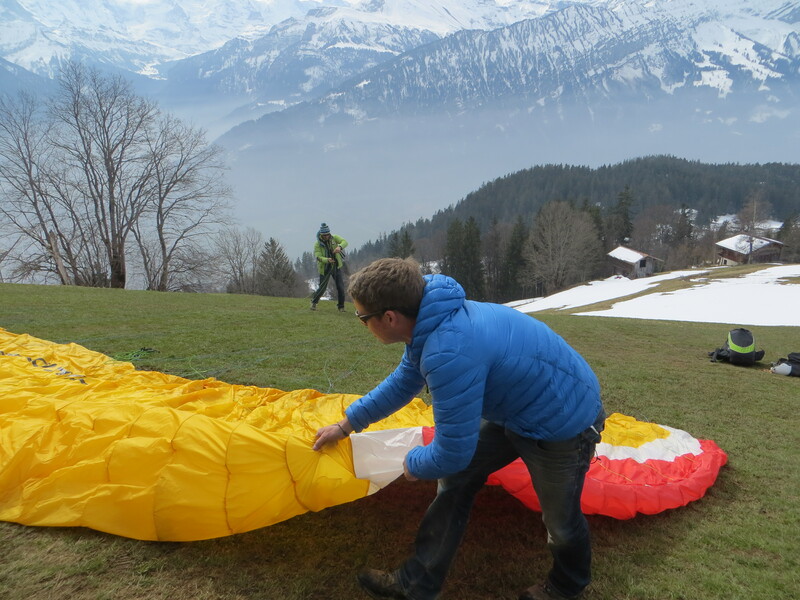 It’s your third flight.” He explained that I could take flying lessons in Interlaken, spread out throughout the year, or in an intense two week course with several flights a day after some ground training. Once you are done, you can buy the equipment (used) for about 1200 CHF. “At that point, it’s a pretty free hobby.” Something to really think about. There is no feeling like it. The flights always feel too short because before long, I was spinning to the ground in dramatic dips and curves before a soft landing. Brendan gave me the thumbs up, clearly high from the adrenaline. I was so excited to see him feeling better and truly enjoying the trip at this point. Yay Switzerland! We packed our bags for the mountains. 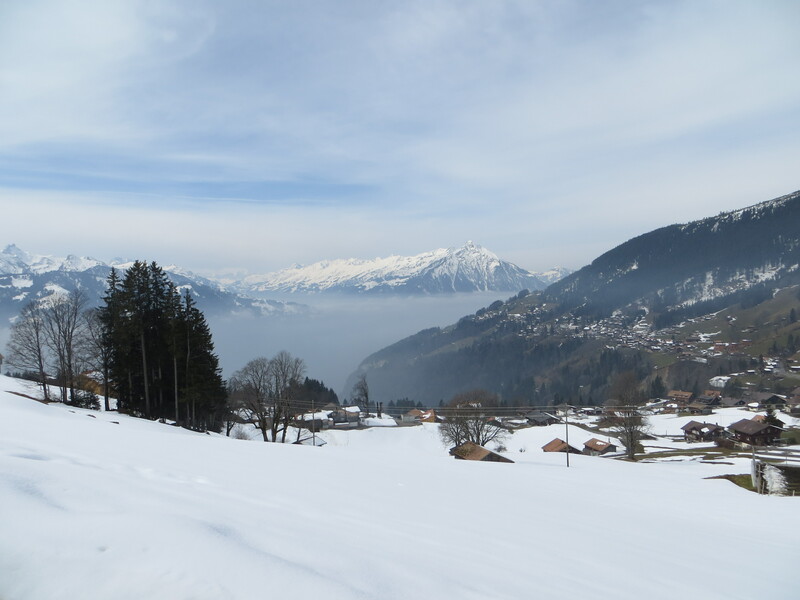 According to my iPhone, it was in the teens and 20s up in Murren and Wengen (two sides of the valley). 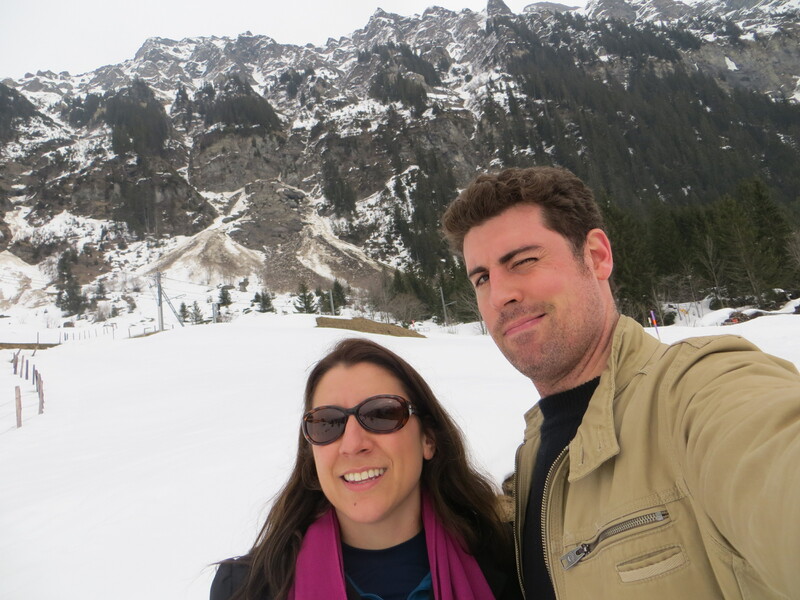 I took him up to Wengen, where I was just visiting with my high school students in February. We hoped the roads would still be snow-covered for some tobogganing. 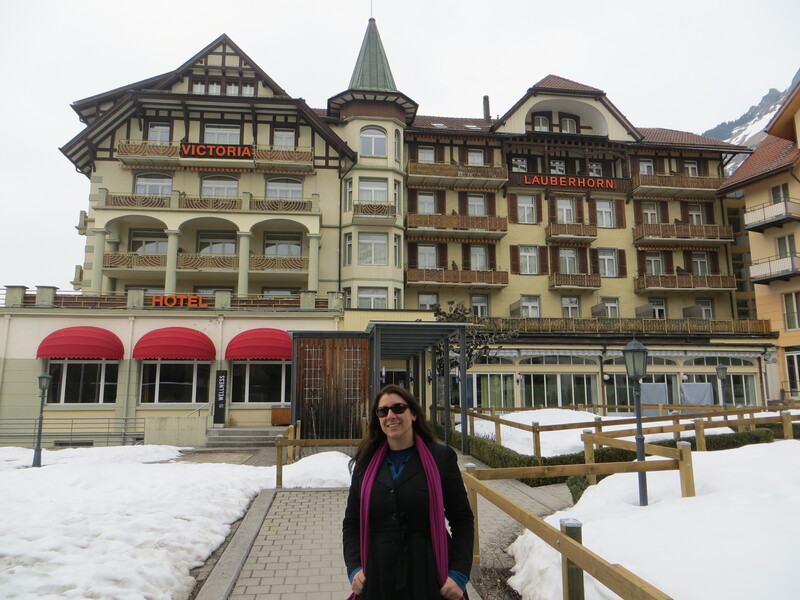 We also packed our swimsuits, eager to use the spa at the Hotel Lauberhorn, where my dad and I stayed in the summer of 2011.
then boarded the cog railway up the mountain to Wengen as Brendan gazed in awe. 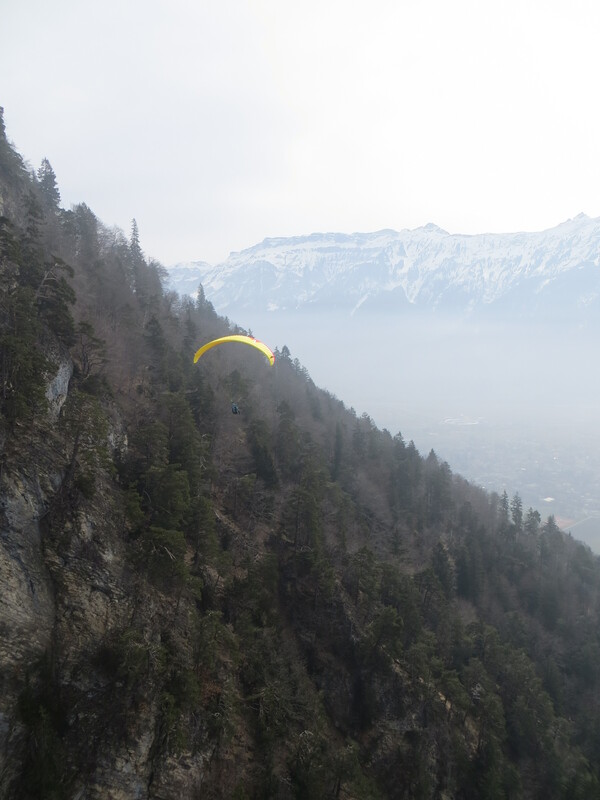 The alps are impressive from the valley and even flying. But we were going way up into them now, and the views were dramatic and ever-changing. 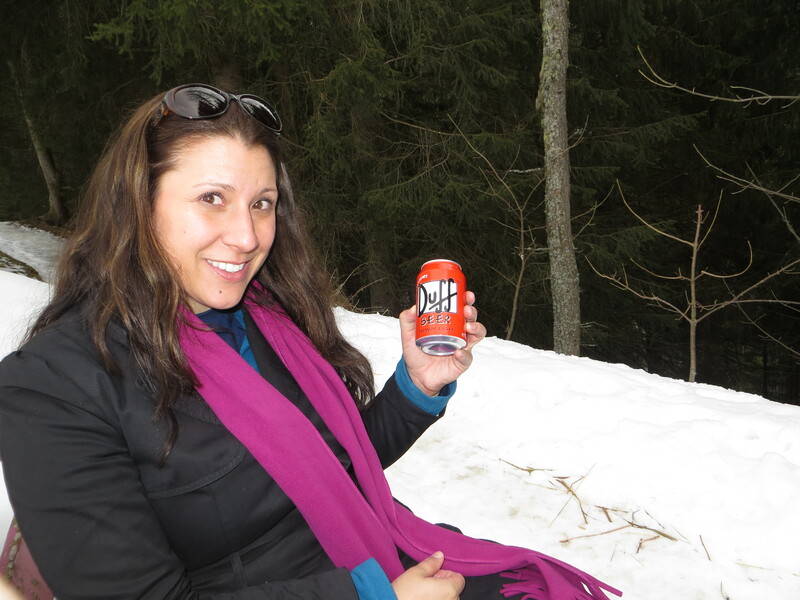 When we exited the train, it was clear that the iPhone was wrong and the snow was melting, so we put our bags in the locker, stopped in the Coop where we found some Duff beer, yeah Duff, and went on a snowy/muddy hike up the mountain. 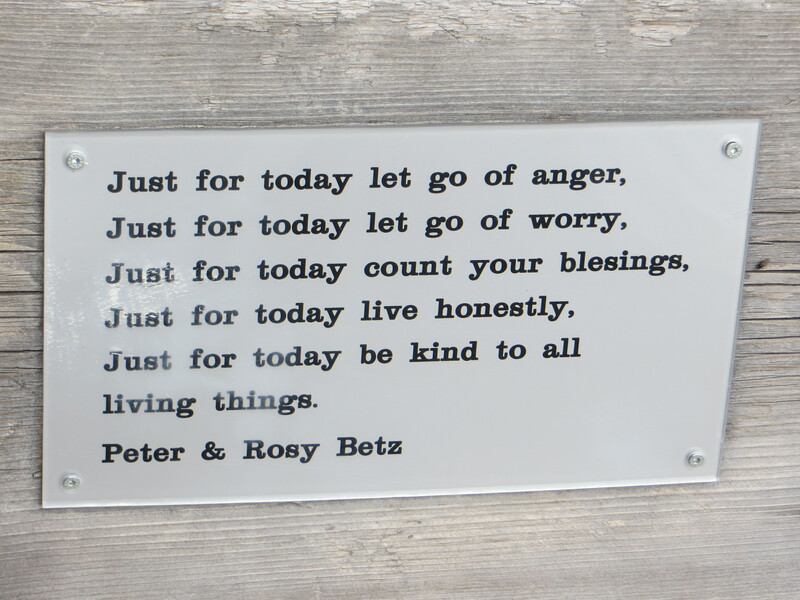 We stopped at a bench on the edge of the woods to just be. It was the most peaceful, wonderful moment of the trip. 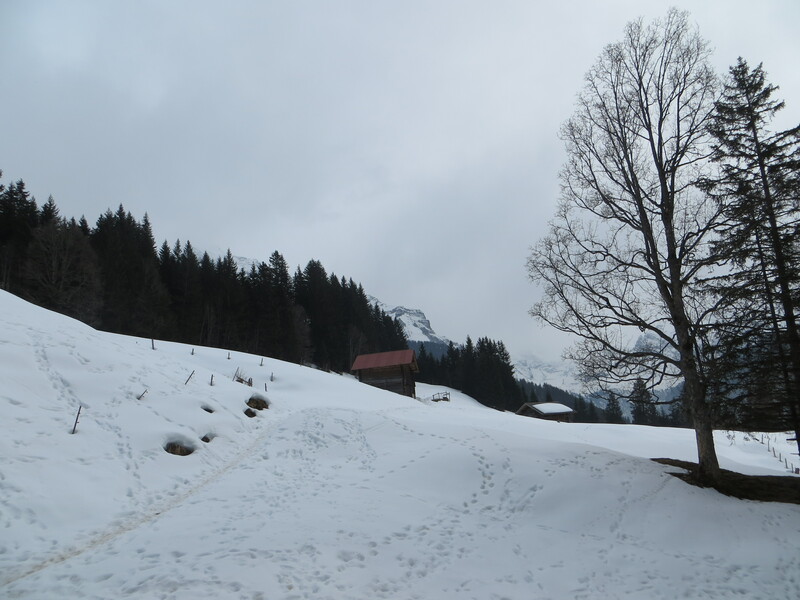 Then back down to Wengen where we enjoyed traditional Swiss food. We ordered fondue with herbs and rosti with eggs and cheese. A hearty mountain meal where I ate with both my father that summer and my students in the winter. We were saddened to learn that the Victoria Lauberhorn was closed for the season (we missed it by a couple of days) so we couldn’t use the spa, to our dismay. 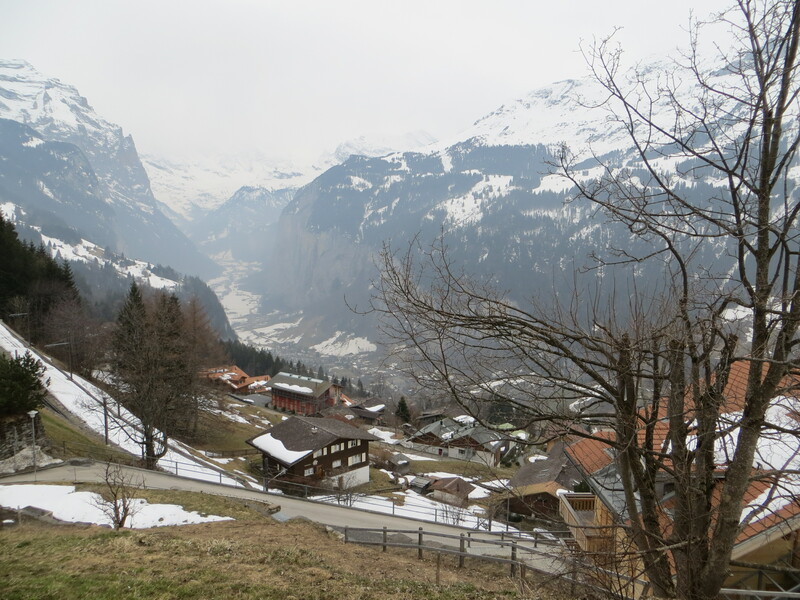 We enjoyed a bit more of Wengen. Then we took a train back down to the Lauterbrunnen Valley and had enough time to walk to the famous waterfall before our train to Interlaken. I thought with all the snow melt, it would be more impressive, but it was just a well-lit trickle. In the summer, it’s a raging, rushing waterfall. However, it was still beautiful and impressive. Then back to town where we prepared to dance. We walked to the disco club, which was quite empty when we entered. Brendan felt slightly uncomfortable and asked what I wanted to do. I said, “We are gonna dance.” We tore up that dance floor, and soon others joined us. 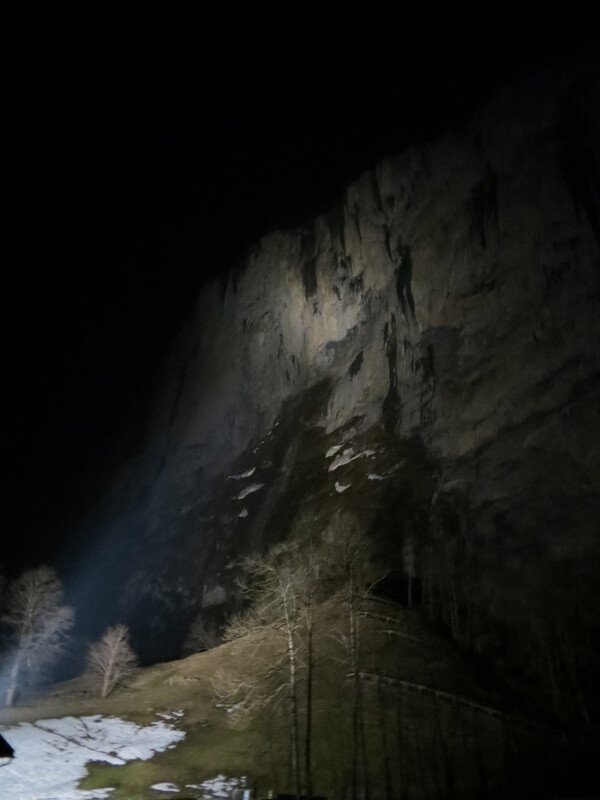 It was a lovely, fun night followed by a nice starlit walk back to our hotel for another sweet mountain air sleep. The next morning, we did not want to stress ourselves unnecessarily with an early train. 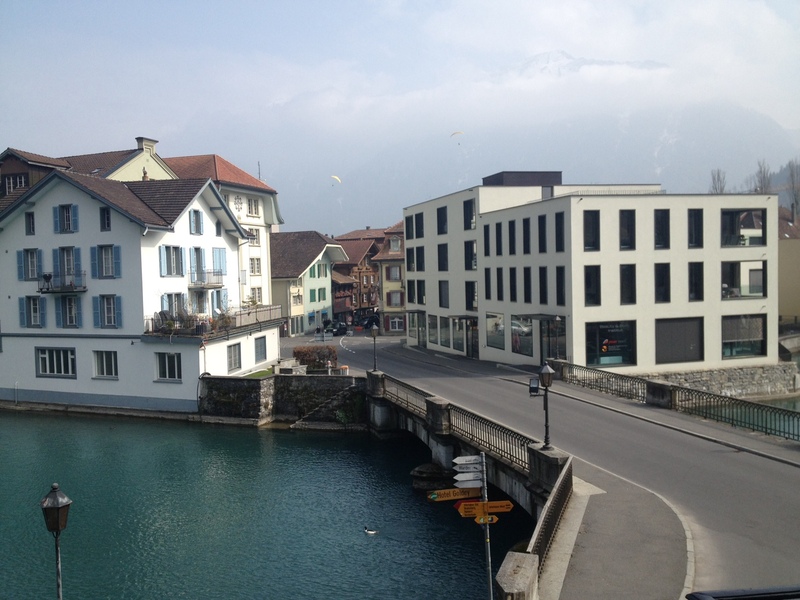 We were woken up in the most swiss way possible. I heard a cacophony of metallic sound in the street. What was this? A bunch of metal wheels? A truck? I went to the window and saw the road filled with a parade of cows donning giant bells. They were heading somewhere. I had to wake Brendan up to see this special site. It truly made my day. Back downstairs for another delicious breakfast, sad that we couldn’t stay another day or two. 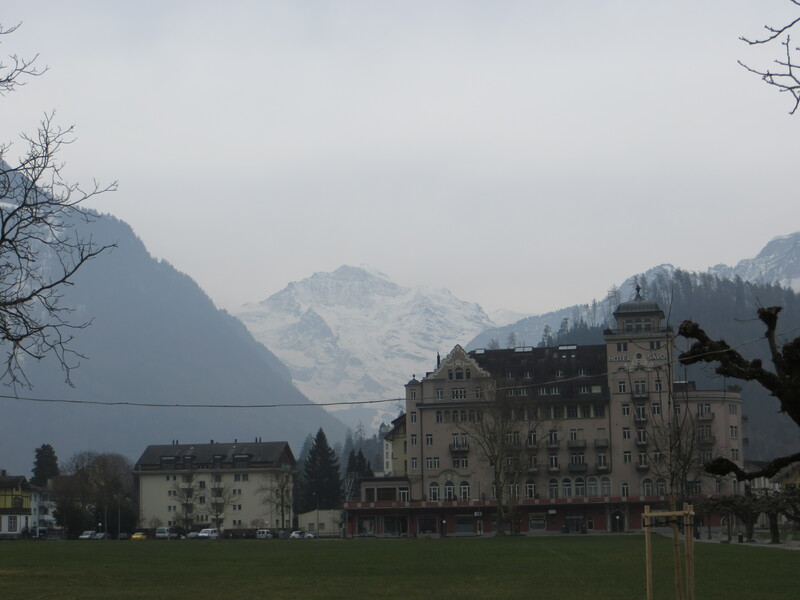 But we were lucky that we had a few hours to enjoy Interlaken before our train. I went to get my Jowissa watch fixed, and we rented a tandem bike, heading through town and back to Bonigen and my swans. What a new, fun experience! The guy at the bike shop was super talkative, friendly and informative, and he gave me tips for my future visits, knowing I like to come so often. 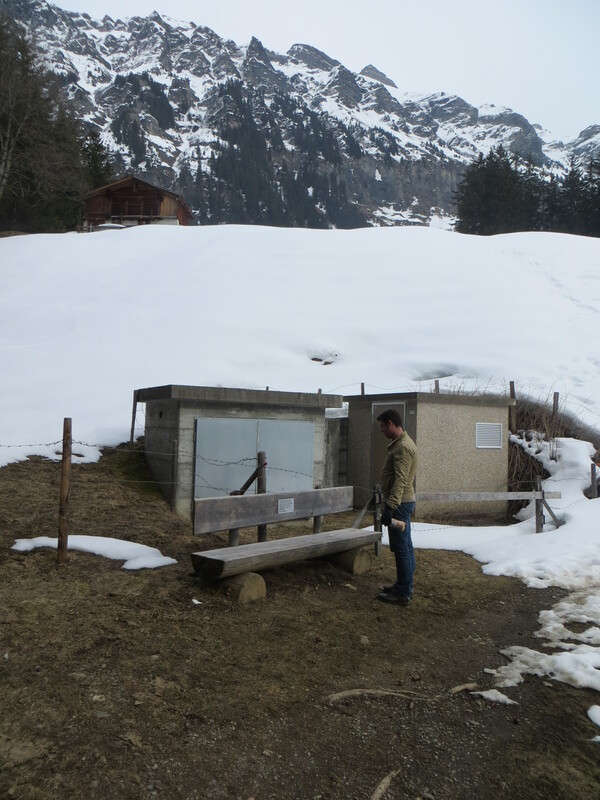 Apparently, there is a special camping hut in the back of the Lauterbrunnen Valley (below Wengen), where you can have a nice, peaceful time. 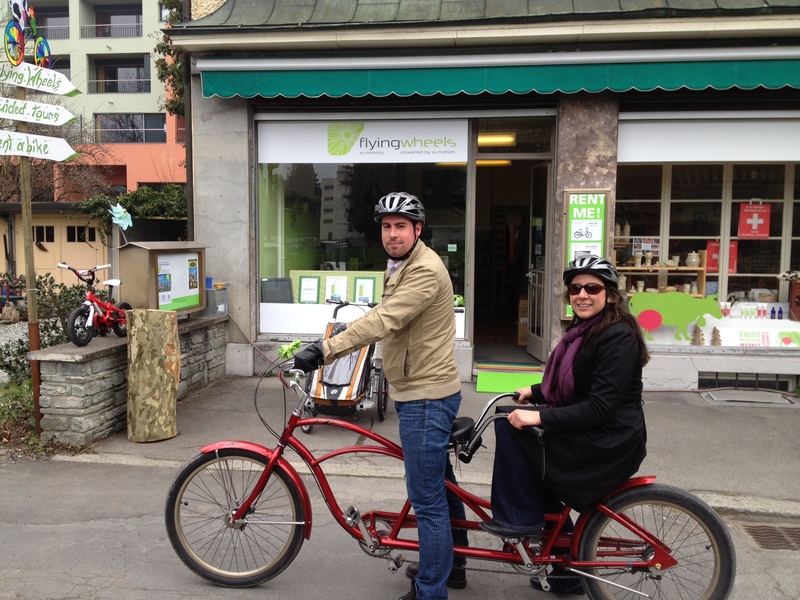 Time was unfortunately running short, so we had to return the bike and grab our bags from the hotel, where we passed the Cow Parade going back from whence they came this morning, perfect bookends to our final day in Switzerland. We grabbed sandwiches from the supermarket, then boarded our train back to Genoa. It was a wonderful stay and always sad to leave, but we had a fantastic time. Brendan said, “I don’t want to steal this as your favorite place . . . but I love it.” Yay Switzerland! Easter Monday, we woke early when it was still dark. Brendan’s hay fever had taken full hold, and I found some Aleve and Claritin to give him to help him breathe a bit better. However, it was a mostly sleepless night before we groggily got ready and headed for the bus to Brignole station. Off to Rome! I was a bit apprehensive after checking the weather all week. 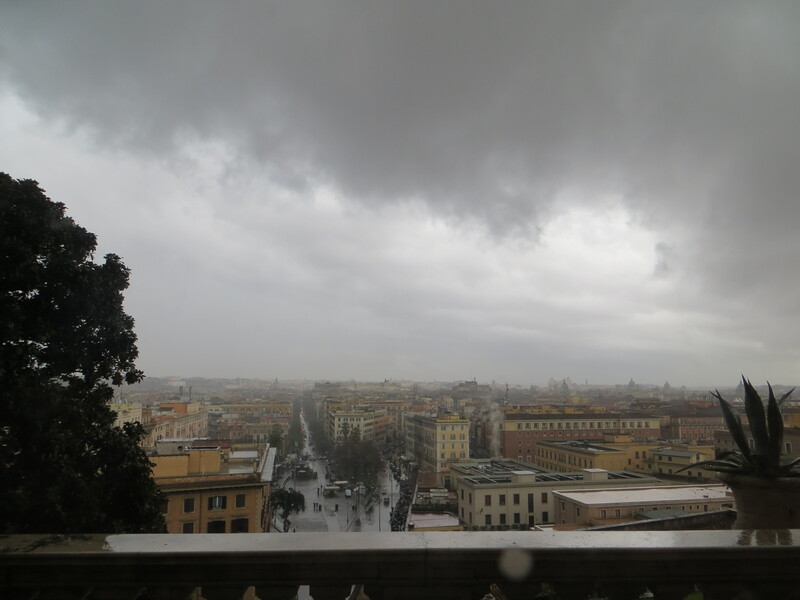 Rome — usually sunny and beautiful in the spring, was showing a soggy forecast. 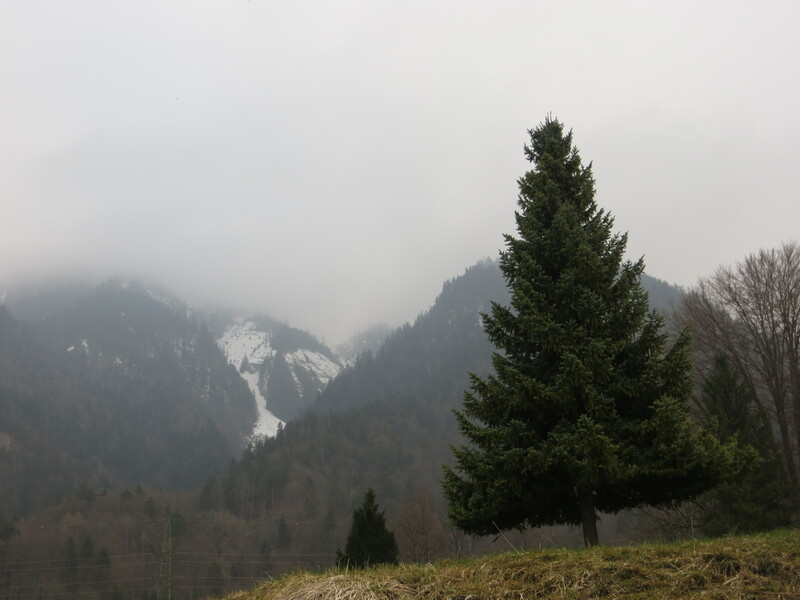 All of Europe seemed to be stuck in unseasonably cold and rainy weather. My students and colleagues told me that it was usually possible to swim this time of year. I felt so guilty because I had told Brendan it would be a good time of year to visit. But all of this is part of travel. I checked my transit ap to see when the next bus would arrive at our stop, growing a bit nervous because it looked like it would cut it close. “Should we take a cab?” I asked. “Whatever you think is best,” he said. I decided to take the risk. The bus dropped us off in plenty of time, we got to the platform, and as the sun began to rise, we saw our train was delayed. “Good thing we didn’t spring for the cab,” Brendan said. Now we both felt like zombies. It was cold and quiet as we waited for our train, moods tense. I felt like I was on an episode of Amazing Race . . . these things happen. And with both of us tired from long workweeks, we both just needed some peace. I was hesitant to book such an early train, but this was just over 4 hours instead of 7 hours, and would give us more time in Rome. Eventually we boarded, and napped our way along the Riviera and down the coast to Rome, pulling into the station around 1pm. It wasn’t raining. In fact, the sun was shining! Brendan was finding it impossible to breathe and still feeling epic jet lag, but we both knew we had to get out in the sunshine for some wandering before the downpours. We dropped our bags off at the hotel which was right by the train station, then saw the Colosseum, The Forum, and other iconic landmarks. I had a Frommer’s Rome Travel Guide, but instead of trying to navigate to one of the suggestions, I figured we’d pop into one of the little cafes on a side street. The food was ok, but mediocre and didn’t impress me or my foodie friend. The price wasn’t too bad, but I knew that Brendan was waiting for some mind-blowing Italian food. Having been spoiled by years of Arthur Ave (Little Italy in the Bronx), featuring the best of all of Italy, he may have been expecting all of Italy to be like that. 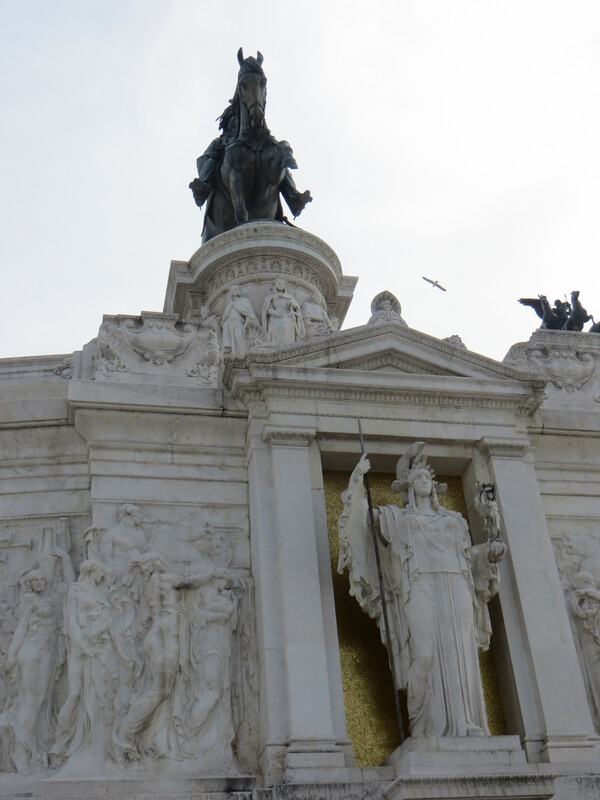 In addition, Rome is known for many things, but not necessarily their cuisine, especially for lunch. We found a pharmacy where, hurrah! they gave Brendan some antihistimanes that helped him breathe with sweet relief. He took a long nap, then we wandered out again at dinner time, once again finding a disappointing dining experience. Mediocre and slightly expensive pizza. “It’s all pizza and pasta, everywhere,” he noted. Yeah . . .
Toting my takeaway Quattro Formaggio, we looked at the tourist map, trying to find the Ice Bar. The winding backstreets of Rome were quaint and a bit empty due to the holiday. If it wasn’t cold and rainy, it would have been more enjoyable but we weren’t really feeling the scene. 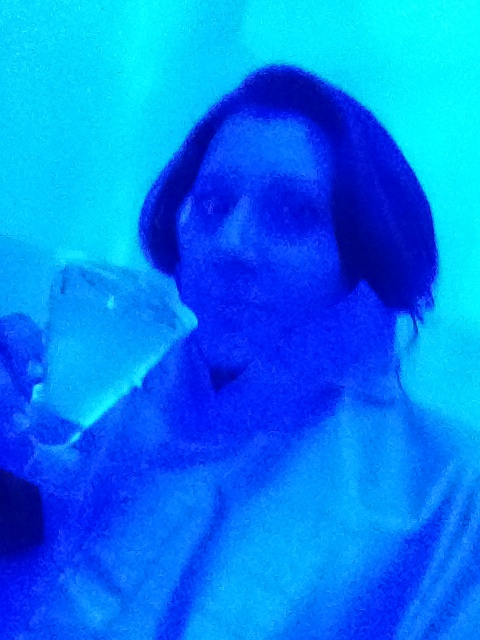 We wandered into the Ice Bar, where we were the only folks. “Come back tomorrow, for open bar for 20 bucks. There will be a crowd,” they advised. Sounded good, so we left and tried a few other places, but couldn’t find a seat or a good scene. We eventually ended up sitting at the bar of an Irish Pub, talking to the Australian bar tender over Guinesses. We walked home past the ruins lit at night as Brendan entertained me with his comedy. Tuesday 2 April, we got to sleep in a bit, waking up just in time to head to the free breakfast upstairs in a sunny room. There was good variety as we woke up and hoped the rain would hold off. 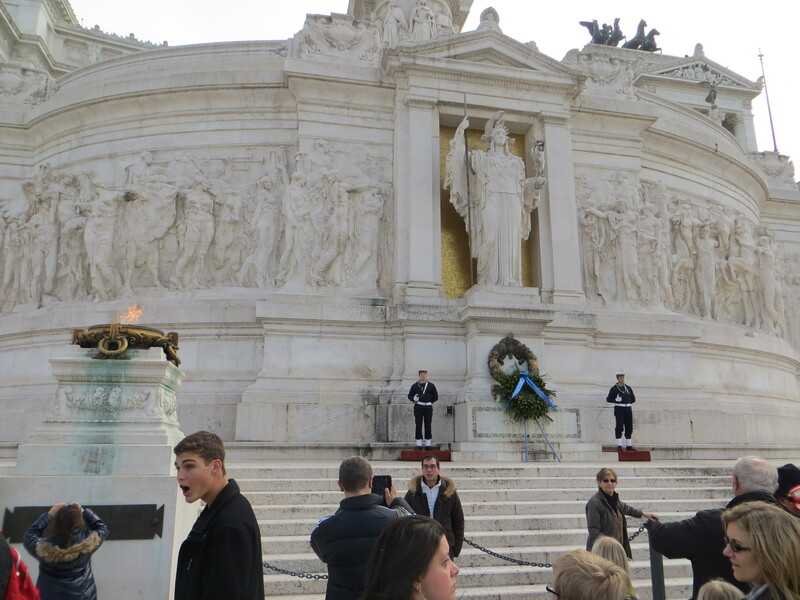 We had “Skip the Line” tickets to the Vatican. For a nominal fee, you don’t have to stand in line for hours. Perfectly worth it. We took the metro and arrived, wound our way through the halls filled with art, peeked out the window at a massive thunderstorm, and eventually found our way to the highlight of our visit, The Sistine Chapel. 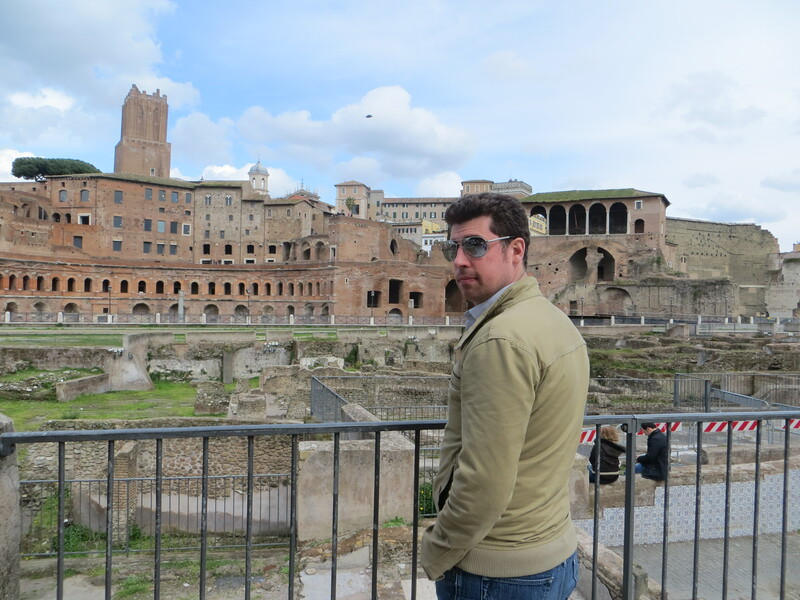 This was my third visit to Rome. Both other times, I had been on EF Tours. 1997 as a high school Junior and last year as a teacher, bringing my own students. 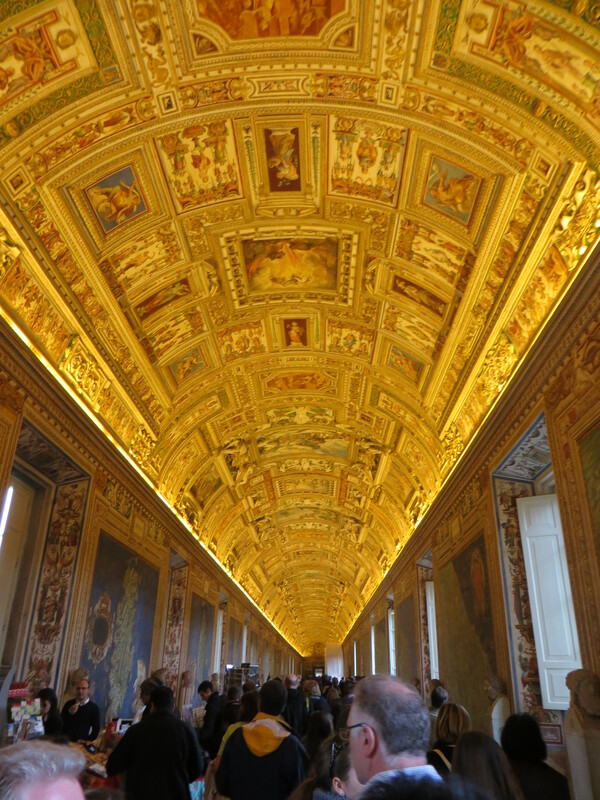 in 1997, we were not able to get admission to the Sistine Chapel, which was a major disappointment. Last year, we did get to go, and I found it to be so moving and one of the most amazing works of art I had ever seen. This time, it actually brought tears to my eyes. It was less crowded than our Easter time visit last year, and I didn’t feel squished and pushed through the room while trying to look up and enjoy. I could really take it in and absorb the wonder as it was meant to be appreciated. Splendid. Brendan identifies with Mercury and even uses the symbol for his brand, as seen on his shirt. Upon our exit, I went into a little gift shop to get pink rosary beads for my great Aunt Minnie. 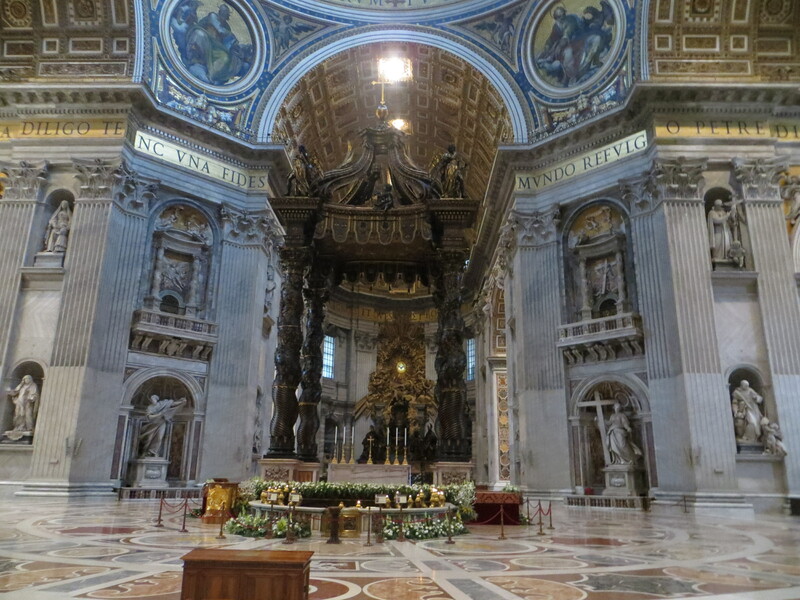 We almost left the premises to get online for admission to St. Peter’s, which we had to do last year. That line was winding around the giant square. 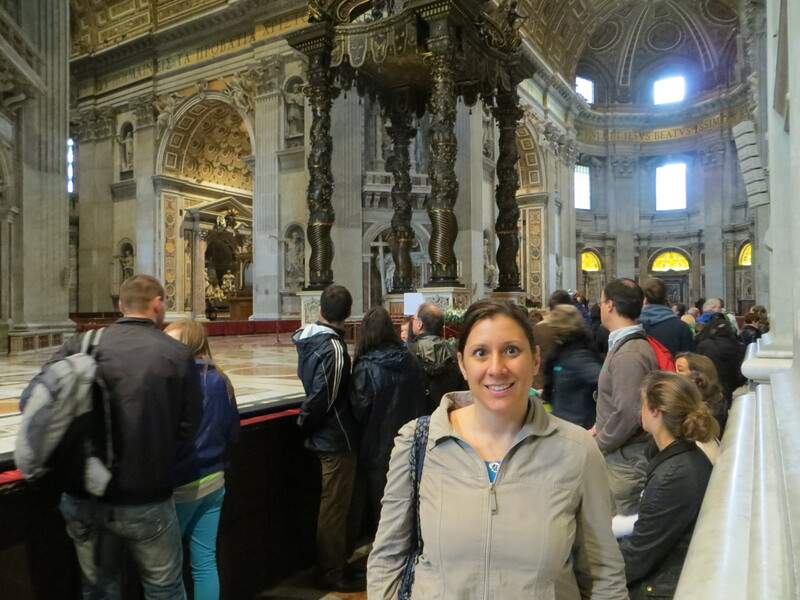 But first, “Let’s just pop into that pretty chapel,” I said, peeking through a door featuring lots of marble inside. We walked in and Brendan immediately said, “Wow!” This was not some little chapel . . . it was St. Peter’s, and we had entered without a line. 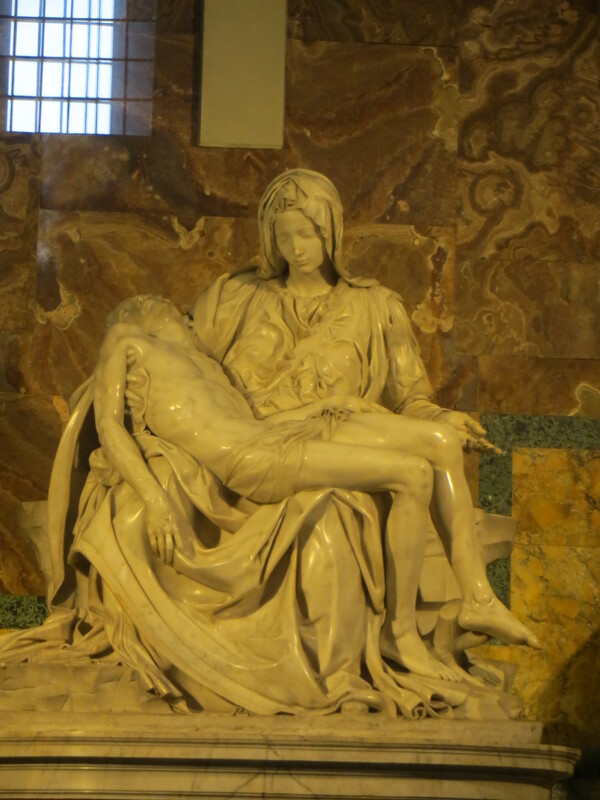 We went straight to Michelangelo’s gorgeous Pieta, and I explained how someone had smashed it in the 70s, so it doesn’t have the original glow, even though it was carefully repaired. It’s still amazing. 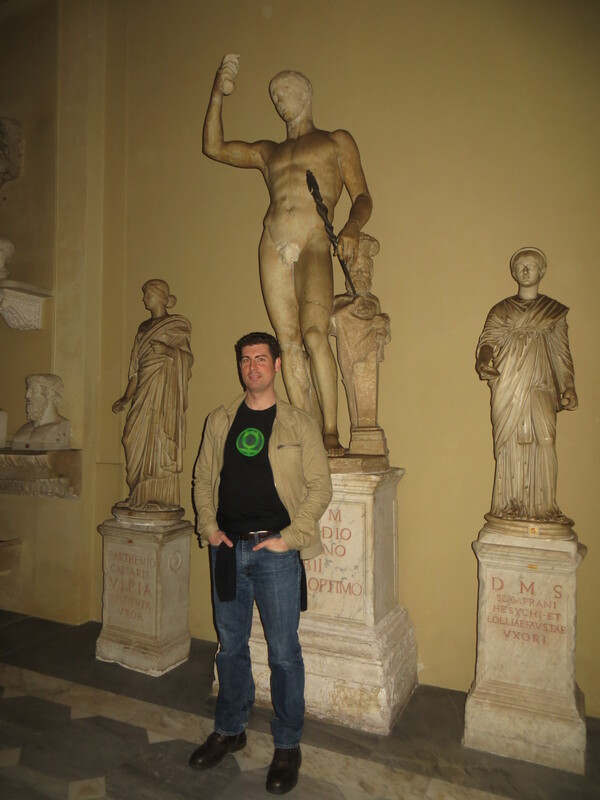 We wandered around, and Brendan was excited because he got to “see a dead pope!” in one of the many tombs. After some pictures and prayers, we exited into torrential rain. First I sent my parents and my friend Kat postcards with the Vatican postmark. 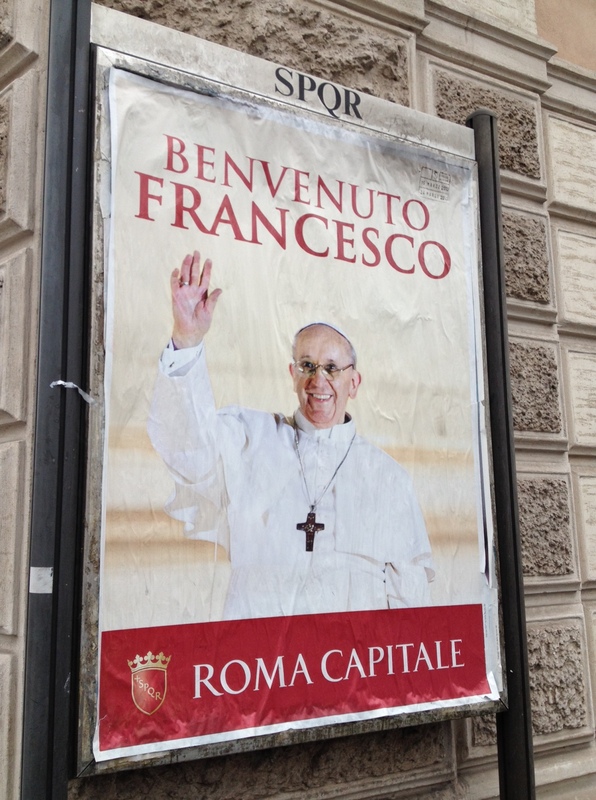 Welcome to the new pope. Eventually, we made our way back to the hotel, cold and wet, and each had a warm bath trying to get our body temps back up. When we departed for dinner, we had plans to head to the Ice Bar, then the Disco after, so I took a small purse and no guidebook. 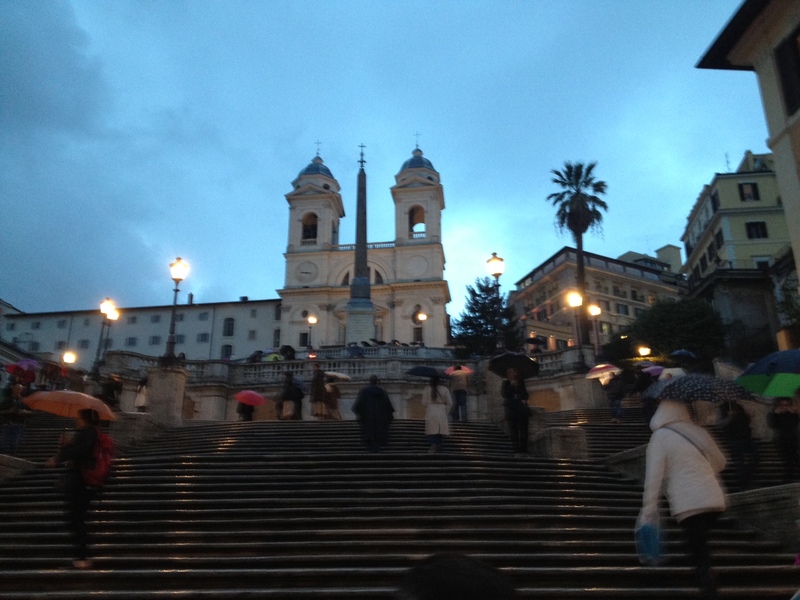 We headed to Spagna, the neighborhood where the Spanish Steps are, and wandered in the rain until we found an amazing, trendy cafe with stadium seats for chairs. There were tiny snacks for aperitivo (that came out with our wine), then I ordered Ceasar Salad and Brendan got meatballs and some pasta. The meatballs were absolutely divine, and as much as I try not to eat lamb, we think there must have been some inside. “This is the pasta I’ve been waiting for!” Brendan exclaimed with pure joy, finally having found the Italian meal he’s been craving. Next, off to the Ice Bar, touristy but fun. Again, we were the only ones there as they draped us in capes. Nobody looks good in a cape. We waddled into the icy room and settled into a little igloo, drinking our vodka mixed drinks out of ice glasses. While we waited for others to arrive, I noticed some glasses left behind and began smashing them like a disgruntled wife. Eventually, a bunch of college-aged kids arrived, and we made small talk. 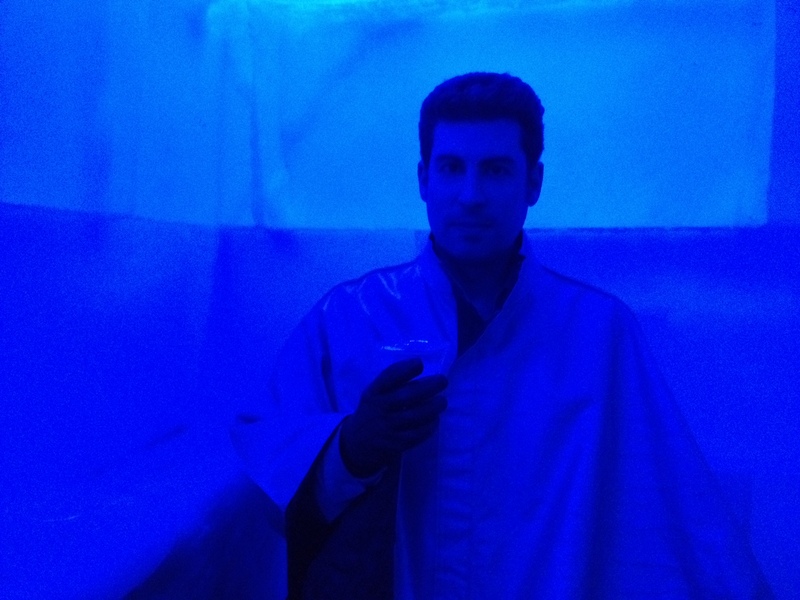 We each had 5 or 6 drinks, and there’s only so much time you can spend in the ice bar, so we waddled on out, but not before taking some photos that made us look like Bond villains. Drunk on vodka, we were too beat and money conscious to spring for the disco, so headed for the hotel and Brendan wandered into a kebab shop for a late night delicious snack. 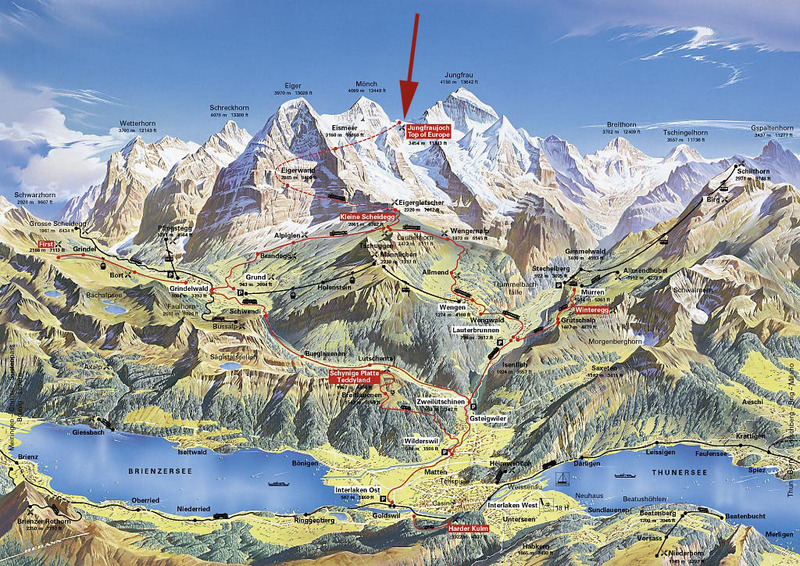 Tomorrow we would depart Rome for the Swiss Alps! 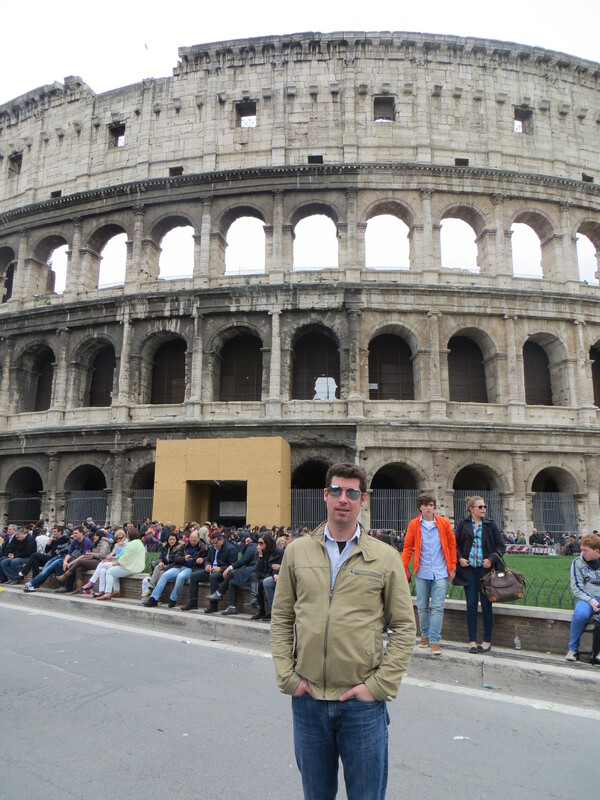 Brendan’s been thinking about Rome for years. Check out one of his many comics, Hannibal Goes to Rome.